A lovely book compiled by Lionel Edwards in 1932. This is a first edition from 1932. Dark Purple hardback cover large format, near excellent condition. No inscriptions or writing inside. 104 pages and 34 plates, of which 8 are in colour. The P.V.H by George Hurst. A v good copy in original cloth, spine sunned staining on the cover.A history of the Peshawar Vale Hunt. Great book with Snaffles Illustations. The same as the original printing. With all the original sketches and prints from the original book. Front Cover of book, cloth bound. 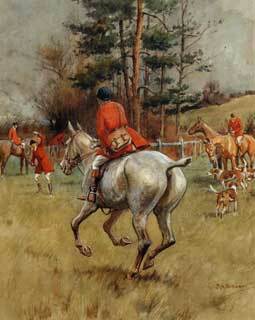 This auction is for a reprint of the classic Indian hunting, military and pigsticking book 'My Sketch Book In The Shiny' by Snaffles. This is in its original format and size (9 x 12 inches). All the plates, prints and drawings from the original publication in 1930 are shown. Paper colour has been changed slightly to to a yellow, the paper is of very good quality and very stiff. almost card. Print quality is good. Condition of these books is brand new and is a hardback. This has to be a great opportunity to obtain a rare publication in a modern printing. It is unavailable at retail, it was published in India on behalf of Directorate General of Artillery Army Headquarters, New Delhi. These ones come direct from that source and are the only copies remaining. The print run I gather (but cannot be sure) was 2,000 (very small). The original version usually sells for between £125 - £250. Eyre & Spottiswoode, London, 1927. Book Condition: Good. Second printing. Quarto. pp: (iv), 123; frontispiece and 15 duotone plates, other illustrations in the text. Bound in black cloth, red lettering and head of fox on spine and cover, top edges gilt. Hard Cover. Book Condition: Fair. pictorial boards. colour illustrations by CECIL ALDIN. wear to outer edges, inner pages has light foxing. London: Allan & Co., 1974. First edition. No. 314 of a limited edition of 750 copies signed by the author. 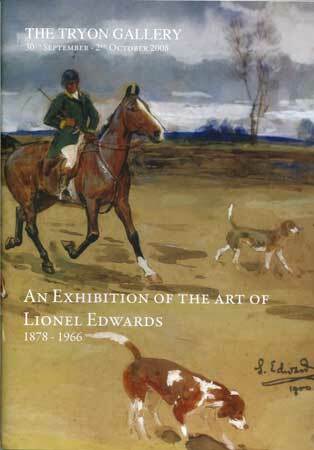 This is catalogue of the works of Lionel Edwards, which were exhibited at The Tryon Gallery in 2008. It consists of 45 pages, each with a colour illustrated picture. It is a great record of Lionel Edwards works. which ran between April 18th and November 4th 2007. 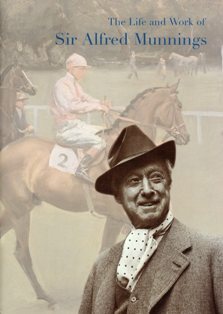 A good background read if you are thinking of seeing the new Munnings film "Summer in February". It consists of 30 full colour pages in A4 size. 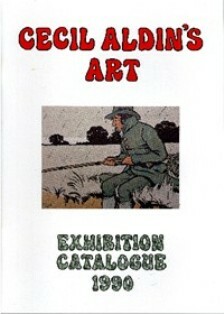 It has 80 colour images of his works and numbers other black and white photographs of him and his subjects. It is a well written and informative catalogue, chronologically going through his life. This catalogue is a must for all hunting and racing households. "Sir Alfred Munnings is regarded now as one of the greatest sporting artists of all time and his equestrian portraits and racing scenes have influenced many of today's young painters. He is one of the few artists who also achieved recognition, fame and fortune in his own lifetime and, as a consequence, he received countless prestigious commissions from al over the world. Today, his original paintings and drawings are collected worldwide and fetch seven figure sums at auction." 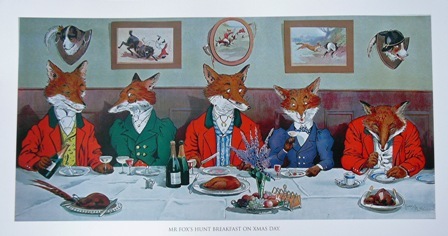 Published by The British Sporting Art Trust in 1990. Forward by Nick Potter. Biography by Roy Heron. Two A4 pages of the forward by The Cecil Aldin expert Nick Potter, of Nick Potter Ltd, London. Four A4 pages of his Biography by Roy Heron. Both give a really good feel for the artist and a good depth of knowledge of his work.